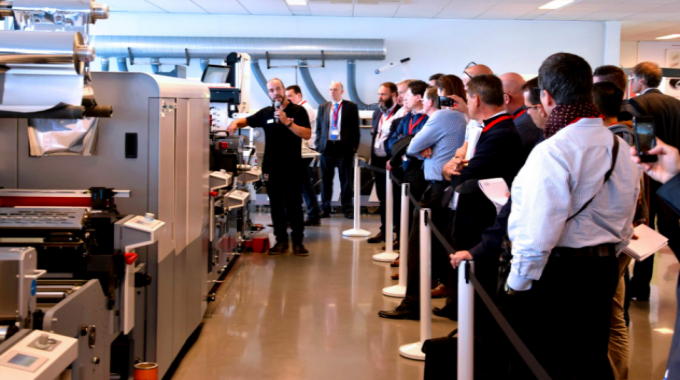 In October 2018, MPS and Domino held two open houses in Arnhem, inviting label converters from across Europe to examine the EF Symjet hybrid label production system combining MPS flexo printing and converting platform with Domino’s N610i inkjet integration module. It is named for symbiosis, the interaction between different organisms in close physical association, to the advantage of both. MPS has reported 15 hybrid presses sold in Europe and North America, with four more sales reported from Labelexpo Americas 2018. Each system is specifically configured to meet the individual convertor’s particular requirements, with varying numbers of flexo units and other embellishment capabilities pre- and post the inkjet system, which is offered as four process colors, plus optional white, with additional colors of orange and violet available to widen the achievable color gamut. I was invited to present an independent view on the relative advantages of hybrid production, with the partners sharing real prices and performance specifications of the machine. 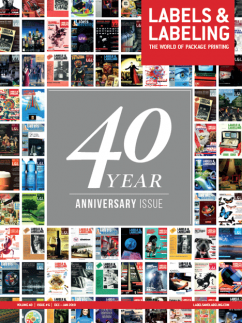 At the event, the machine, with fast changeover capability, was demonstrated; changing format, cold-foiling, substrate and finishing took just a few minutes, with the inkjet unit printing versions seamlessly, including spot color changes, and the white printed with flexo, all combined with varnishing and die-cutting. It proved to work very well, producing some real added value embellished labels. The hybrid printing delivered cost benefits for the particular designs that were produced when compared with narrow web flexo needing multiple plate changes, and against pure digital where slower toner press speeds and potential higher consumption of inkjet ink (dependent on the job) were penalties, along with a separate second pass for varnishing and finishing. To be fair, it is not uncommon for digital to have in-line finishing too. So, when there are multiple SKUs and version changes, hybrid production works out to be cost-effective and will take less time. While initial make-ready may be a little longer than the pure flexo or digital alternatives, the reduced time for subsequent plate changes and especially if you were to add the time for a separate finishing run means a single pass hybrid run, at 70m/min in this case, is very efficient. It is enlightening to examine the relative merits of the alternative printing methods that can be used to manufacture labels and sleeves. Using a simple costing tool is probably the best way to model the costs, inputting realistic performance expectations and costs of consumables, service, labor, together with the capital cost of the press involved, to determine where the economic crossover point is between the methods. Most equipment manufacturers, including Domino, now offer such an approach. The comparative costing tool under discussion here has been developed over many years, initially from the author’s requirement to determine the most appropriate investment case in print companies and it has been refined to make it applicable for labels. It uses real production costs, the actual street prices and true press performance obtained from observations and discussion with press operators as well as information from the equipment providers. The real cost of manufacturing a label is determined by many factors, not all are due to the print method used. Different converters may use an identical press in different ways. The work mix will differ, shift patterns may vary and set-up and running speeds will not be the same. The equipment and consumable suppliers may vary their pricing for the same items depending on the location or print volume. Operating one or multiple presses impacts the support cost, as does the operator skill level. Obtaining this real cost and performance data is not easy. How a company uses its machine will determine the costs with higher throughput resulting in lower costs alongside high efficiency. The cost model is designed to allow any converter to input their real costs and actual performance measures, in order to provide a true representation. The capital cost and depreciation period with finance cost determines the annual cost, along with direct labor and servicing charges. Usually the equipment will have an hourly rate that depends on the shift patterns and equipment uptime. Then a job cost will take the production time into account, including set-up and make-ready as well as the running time that depends on the press running speed. Even for the same machines the factors will be different at every label converter, because the level of competence (in administration and pre-press as well as printing and finishing) may differ, as will the company culture and quality standards. The cost of plates, how many times they are reused, and any mounting tapes should be considered, along with the price of toner or inkjet ink, either as a click charge or bought by volume. Then there is the cost and time of finishing, including the cost of tooling – whether full rotary cylinders or a magnetic quick-change die, and taking account the number of times they will be re-used. All these factors are input into the model, together with details of the specific jobs and any versions, with the relative cost of manufacture calculated against run lengths. The model calculates the production costs of each method involved over a range of run lengths, determining the economic cross-over point where that process becomes lower cost, if indeed that happens. A graph of unit cost of production against the run length is plotted for any label specification. In this case the hybrid configuration proves to be the most cost-effective method for runs between about 500 and 2,200 linear meters against other methods. It is interesting to see the elapsed time of production of a nominal job, in this case a run of 15,000 self-adhesive labels, five versions involving a black text change sized at 100x100mm printing six digital colors with base white and two flexo overprints including varnish. Labels are die-cut, slit and rewound. In the case of near-line finishing the elapsed time may vary for a job according to the web width involved, hence the differences above, and there may be additional time between completion of the printing and commencement of finishing according to machine or labour availability. Converters can use the result to work out the most economic method to produce a specific job, or a mix of work showing the potential profitability of a print method – provided that the capacity can be sold, of course. The total time needed to complete a job is generated which can be a useful method in comparing the responsiveness. The model allows users to change shift patterns, ink coverage, flexo plate costs (and how often they are re-used) which makes an enormous difference. Actual machine speed and uptime is input, taking into account the impact of multiple passes and the label size in a semi-rotary mechanism that may impact the speed of a semi-rotary press, for example. The permutations can get quite sophisticated to include finishing because some methods demand multiple processes and converting options that build up the manufacturing cost. There may be a primer or a top-coated substrate needed for some presses which is also taken into account. The model compares the costs and time of different methods used in label production. As well as simple comparisons it can be used as a tool to calculate by job, by time, added value, even the annual capacity looking at a variety of job runs and types for a range of equipment. The key is to use actual costs to obtain real world comparison for a converter considering an investment. 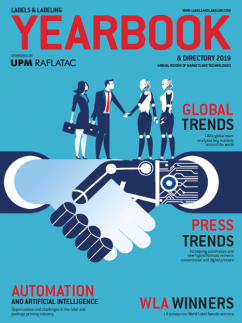 This is important because the technology provided by press vendors is continuing to develop in both flexo and digital methods. The costs of manufacture within a company will change with greater experience, of course. As users better understand how they can exploit the capabilities of their presses, and the necessary workflow, their productivity will rise. Such developments mean that costs change, so converters should keep up to date with technology they do not necessarily use to make sure they do not miss opportunities. They must avoid a fixed mindset because costs of production are changing, and this is where a model that can be updated is most useful for converters. It helps management determine which production technology will benefit their business most. 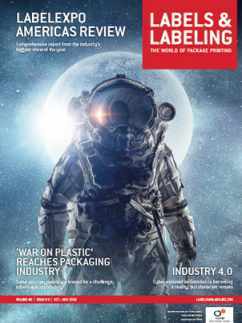 The cost of label manufacture is a key determinant in the choice of a new press and is the key reason for the growth in inkjet and hybrid press sales in Europe, which overtook toner presses for the first time in 2017 according to the Finat Radar Survey Vol 9. In theory the costs look attractive. Just as important is the productivity, with a simpler single pass method including embellishments and finishing, reducing manufacturing time and labor cost with less material handling otherwise required with a separate finishing process. The sector is developing rapidly. I don’t think that the 2017 status will be the case in 2019 as new technology comes to the market. The success of hybrid production demonstrates that the cost-effective analogue production married with agile digital capability is a winning combination. 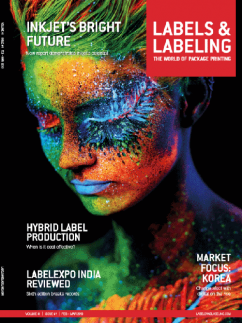 Dr Sean Smyth, print and packaging consultant, provides an independent analysis of the benefits of hybrid label printing. With over 30 years’ experience, he has worked for a variety of print businesses across the supply chain. He now acts as an independent consultant.